According to this OPB report, the Beaver Creek Fire has already cost $11 million to subdue. In the autumn of 1918, at the end of the First World War, Arnold Schoenberg founded the Society for Private Music Performances (Verein für musikalische Privataufführungen) in Vienna, Austria, with the purpose of performing contemporary music for an audience that was firmly committed to hearing new work. Over the next three years, until 1921, the Society gave 117 concerts of works by composers, such as Stravinsky, Bartók, Debussy, Ravel, Webern, Berg, Scriabin, Suk, and Mahler. Many performances featured orchestral works that had been distilled into versions for chamber orchestra. One of these was an arrangement by Schoenberg of “Das Lied von der Erde” (“The Song of the Earth”), which Mahler had finished 1909. Schoenberg began his arrangement in 1920, but he apparently abandoned it in 1922 when the Society went bankrupt. German composer Rainer Riehn took up Schoenberg’s sketches and completed the arrangement in 1983, and it is this version for 14 musicians and two singers that the Martingale Ensemble under the direction of Ken Selden recorded last year. 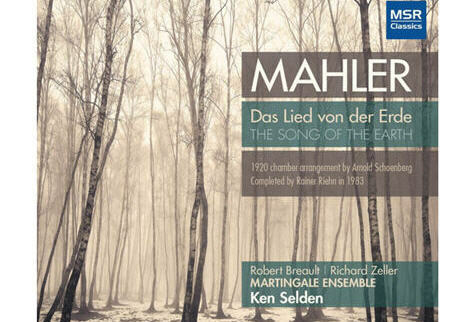 Featuring tenor Robert Breault and baritone Richard Zeller, the album, on the MSR Classics label, has just been released, and it’s a revelation to hear the breadth of Mahler’s angst-ridden music in this reduced yet elegant version. Mahler wrote “Das lied von der Erde” at a time in his life when he experienced a lot of disappointment. In 1907, anti-Semitism forced him to resign from the artistic leadership of the Vienna Court Opera, that summer his eldest daughter died at age of 5, and Mahler himself was diagnosed as having a serious heart defect. In the midst of this turmoil, Mahler became inspired by Chinese poetry that had been adapted by Hans Bethge and set six poems to music in a form that has been described as a hybrid symphonic song-cycle. Much of the text is dark and filled with anxiety. It is fascinating to hear how a spare group of instrumentalists evoke the main orchestral themes. Schoenberg/Riehn use all sorts of unique combinations to create the some of the same kind of sounds that larger forces make in Mahler’s original, for example, the first song “Das Trinklied vom Jammer der Erde” (“Drinking Song of Earth’s Sorrows”) ends with low notes from the piano and a few other instruments rather than with the low brass. Of course, the lushness of a full orchestral sound is missing, but the bare, exposed lines in the chamber version can drill just as far into the heart. The musicians, consisting of members from the Oregon Symphony, Third Angle New Music Ensemble, the Florestan Trio, Northwest New Music, and 45th Parallel find just enough Viennese schmaltz to make the music ring true. Breault fills the drinking songs with gusto and bravado of a man who feels that life is futile. His tone is slightly reedy, but the passion of his delivery imbues the music with a firm sense of conviction. The most unique feature of this recording is use of a baritone instead of the traditional mezzo-soprano for three of the songs. This is the first recording I have found that has tried such a combination, and it works well because of the warmth of Zeller’s voice. When he sings of beautiful maiden who yearns for the handsome young man in “Von der Schöenheit” (“Of Beauty”), he delivers the text gorgeously. And he sings the last words of the piece “ewig… ewig” (“forever… forever”) in a haunting way that lasts and lasts. Ken Selden sets excellent tempos throughout and shows extra attention to dynamic details. This recording is the second one in which Selden has mined a gem from Schoenberg’s Society for Private Musical Performances. The first one, released in 2011, was a chamber music rendition of Mahler’s Fourth Symphony and of Debussy’s “Prelude to the Afternoon of a Faun” with the Martingale Ensemble (reviewed here). Both recordings are available on Amazon. (PORTLAND, Ore.) – The Oregon Symphony and the Portland Japanese Garden are teaming up to help make the Garden’s 50th birthday as big as it deserves to be. To honor the Portland Japanese Garden’s 50th Anniversary, the Oregon Symphony and Music Director Carlos Kalmar programmed a very special concert to open the 2013/14 Classical Concert season. The concert features a percussion concerto, From me flows what you call Time, by Japanese composer Toru Takemitsu, as well as Rimsky-Korsakov’s Scheherazade based on Eastern-inspired tales from One Thousand and One Nights. 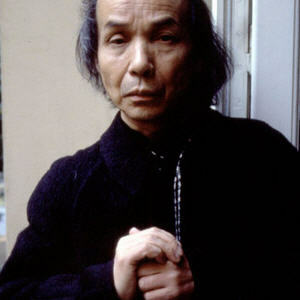 Unlike the explosive sound often associated with a percussion concerto, Takemitsu’s piece is delicate and quiet, much like a walk in the Garden itself. The Arlene Schnitzer Concert Hall will also look a little different with colorful ribbons extended from the stage into the upper seating areas where they are connected to chimes activated by one of the five percussion artists on stage. The Portland Japanese Garden, founded in 1963, is the most authentic Japanese garden outside of Japan. Situated on 5.5 acres in the scenic West Hills of Portland, and featuring five traditional garden styles, the Portland Japanese Garden is open year-round to nearly 250,000 visitors per year. The purpose of the Portland Japanese Garden is to create, maintain, improve, and administer an authentic, world-class Japanese garden in the city of Portland and to offer compatible educational, cultural, artistic, horticultural, environmental, and charitable activities. For more information, visit japanesegarden.com. Alwyn Mellor (Brünnhilde) and Stephanie Blythe (Waltraute). 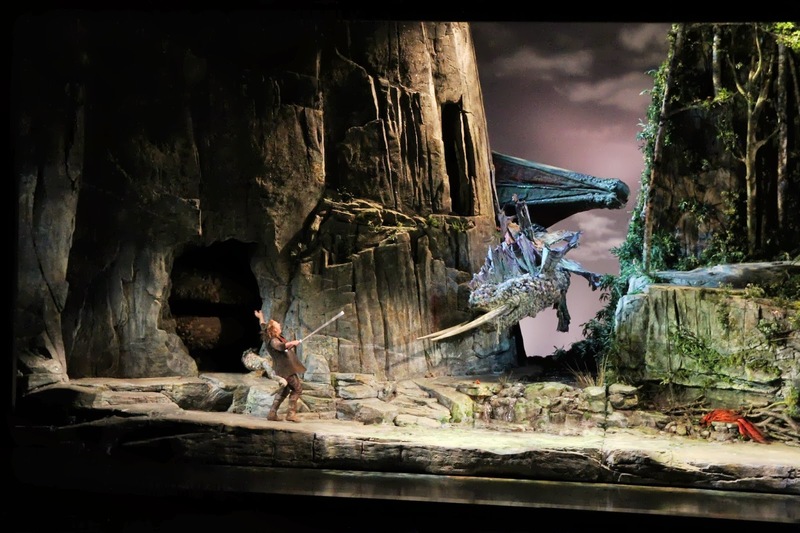 The apocalyptic finale of the first of three performances of Wagner's Ring cycle took place on Friday, August 9 by the Seattle Opera at McCaw Hall as the curtain raised on Götterdämerung. Sparks flew, relationships crumble and worlds ended, yet somehow the sensation was not as satisfying as I expected. There were certainly some fine performances; Stefan Vinke's Siegfried was as carefree and naive as ever, and Lori Phillips' Brűnnhilde gave an excellent example of the old 'hell hath no fury' saw, though vocally at times she had difficulty cutting through the dense orchestration. Stephanie Blythe did double duty as the second Norn and a spectacular Waltraute. Daniel Sumegi was a suitably spiteful as Hagen. Markus Brűck as Gunther and Wendy Bryn Harmer as Gutrune were less convincing; vocally Bruck was not as powerful as one would like, and the portrayal at times fell flat. Perhaps it is the nature of the characters, but Gutrune and Gunther were the least emotionally engaging. Renée Tatum (Flosshilde), and Stefan Vinke (Siegfried). Some highlights included the delightful idyll wherein the Rhine Daughters almost convince Siegfried to return the ring to them. Jennifer Zetlan, Renee Tatum and Cecelia Hall displayed a spectacular unanimity of timbre and as perfect a blend of sound as one could want. They seemed to be a wilder sort of creature than the other gods and quasi-gods; more akin to Erda or Loge in character, as befits their stature as incarnations of nature. 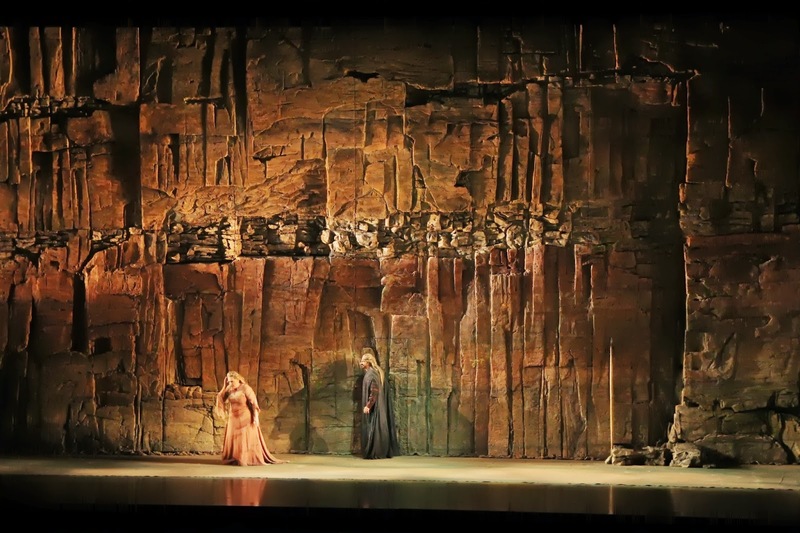 Brűnnhilde's wrath at Siegfried's unwitting betrayal was as frightful in its way as Alberich's or Wotan's imprecations from earlier in the cycle. It was nice to hear a chorus, and it was particularly well-done; the crowd of soldiers seemed to grow onstage organically as Hagen summoned them, and by the time the large, lusty chorus was there it was great fun to hear them go at it. Some of the other blocking at times was distracting; Hagen did an awful lot of standing around or slowly walking back and forth without any seeming purpose. It was difficult to suss out whether it was the performers who were tired, though those who had been onstage for several nights still felt largely energetic, or whether the emotional highpoint of the drama seemed to have been reached in Siegfried; while there is some great music in the final installment of the tetralogy, from a dramatic standpoint it seemed in large part to exist to tie up the loose ends. Since this is my first Ring cycle it is difficult to say with surety wherein the letdown lay but I can say that Götterdämerung was far and away my least favorite of the four. At the end, it ultimately seemed that the gods got what they deserved. The immolation was cleverly portrayed, and the sets again deserve high praise; Gunther's magnificently carven halls were a beautiful contrast with the rest of the sets, and served well to illuminate the final conflagration. It has been a spectacular experience, and somewhat emotionally exhausting. There is a curious sort of post-Ring depression; by the time Sunday night rolled around it seemed odd not to have four or five hours of incredible musical drama to attend. One thing that is certain: this first Ring will definitely not be my last. Musical America (subscription only) reported that American composer Stephen Paulus has been in a coma for the past month. Paulus, age 63, suffered a massive stroke on July 4th. He has composed over 500 works and is known primarily for his operas and choral pieces. 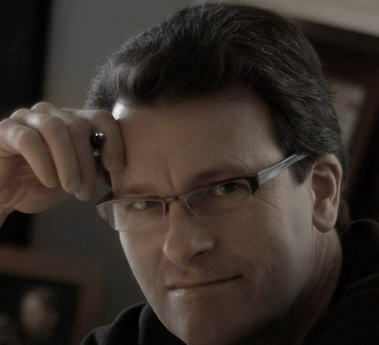 He achieved much acclaim for his 1982 opera "The Postman Always Rings Twice," which is one of several operas he has written for the Opera Theatre of St. Louis. Paulus's website notes that scheduled concerts of Paulus's music are moving forward with a "premiere of “A Refined Reflection”, commissioned by organist Caron Farmer to be a lyrical second movement for Baronian Suite, which was named in honor of Pipedreams® host Michael Barone. She is scheduled to perform the work at a recital in Michigan on August 14th." A week ago, my wife and I visited the Lava Beds National Monument in Northern California (about 45 miles south of Kalamath Falls, Oregon) when we saw this boulder. The image of Wotan, complete with eye-patch, is remarkable! The indomitable hero Siegfried may not know the meaning of fear, but the opening of Seattle Opera's Siegfried had one critic huddled in his seat, shivering with apprehension before the curtain was ever drawn. Rumbling sinuously out from the depths of the world it seemed, Fafner the Dragon's leitmotif on the contrabass tuba began this the third installment of Wagner's Der Ring Des Nibelungen. Stefan Vinke, in his SO debut in the title role, was actually a little hard to like at first. So hard, in fact, that I didn't realize it was by design until later. This boorish, ignorant young man, besotted by the hubris of youth, rattled along in quasi-parlando fashion at first, braying about his hatred for his guardian Mime (Dennis Petersen), the only other person he has ever known. As he brings The Bear (JC Casiano) onstage to bully the hapless dwarf in hilarious fashion, again there was a bit of schadenfreude in the laughter, making it all the more enjoyable. Why do we laugh so to see poor Mime tormented, wretch though he is, in Das Rheingold and now in this? Petersen's portrayal of Mime, and the duality of the relationship with Siegfried, was fascinating to behold. Not only was Petersen's voice marvelous, his diction impeccable and precise, but, despite the fact that he is ultimately planning to kill Siegfried, and the fact that Siegfried himself wouldn't cry to see Mime go the way of the dodo, he and Vinke show that there is a curious intimacy between them, for all of Siegfried's berating and bullying. These two men as actors show that, though their characters can't stand one another, damned if they aren't (for the time being) stuck with one another, and that has forged a curious bond, an unwanted yet at times adorable tenderness in spite of both their ultimate intentions. Greer Grimsley returns in Wotan's disguise of The Wanderer to further his ambitions as to his progeny; there is a palpable, rising tension in his and Mime's exchange of riddles that culminates in the gnome's being let off the hook. Of special note too in this act was the duet-like connection between Mime and the bassoon; delicious to hear. When Siegfried forges Nothung again Vinke sings this with such effortless power, such vivacity and ease that it was electrifying, positively riveting. An absolutely incredible display of musicality and vocal prowess; his rave reviews from last year's Covent Garden Ring were no fluke. The creeping sense of dread that accompanies Fafner's leitmotif returned in even stronger fashion as the second act opened...such a visceral, visually evocative sensation long before we ever see the dragon. Richard Paul Fink returned as Alberich and he and Grimsley engaged in a duet filled with believable tension and hatred as they spoke of their competing claims as to the outcome of Siegfried's coming confrontation with Fafner, though we are left wondering why the Wanderer is (seemingly) so unconcerned as to what happens if Alberich gains control of the Ring and makes good on his promise to storm Valhalla with the armies of Hella. Siegfried's attempt to convince the dizzyingly coloratura Forest Bird (Jennifer Zetlan) to speak to him again was again one of the many moments of levity sprinkled throughout, and we are tempted to forget for a moment (as does Siegfried) the lurking menace of the dragon so near, which reminds us again that, though Siegfried is fearless, we are not. As the gruesome beast finally rears its head in a beautiful piece of stagecraft, an impressive and draconian image with sprawling leathern wings, hoary head and snake-like coils, there is still a sense of humanity there--Fafner (Daniel Sumegi) is somehow visible through the Tarnhelm's disguise. 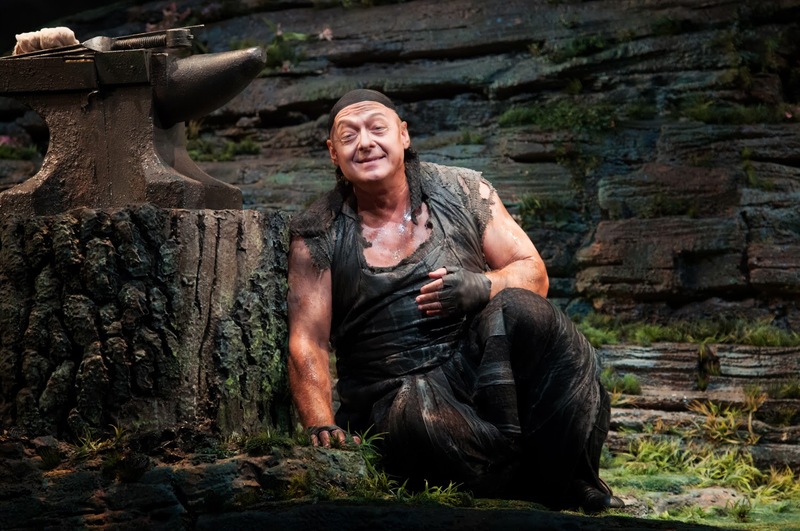 After he kills the beast, and Mime shortly afterward, Siegfried's strange tenderness toward both his slain foes shows that he does in fact know something of love, though he is not aware of it. By this point the brash youth has surely won our affection. Lucille Beer as Erda is summoned by The Wanderer, and sings her role in a mellifluous, incredibly resonant contralto. She and Grimsley engage in a slow, strange dance, elegant though dilatory like the ponderous movement of techtonic plates, and the feeling is heightened by the ruddy hue of the ancient setting in which they dance. Beer displays without questions Erda's qualities, having all the bearing of a deeper and older spirit than even Wotan himself. When Wotan is defied and ultimately overcome by Siegfried, The Wanderer's strangely calm acceptance of the eventual outcome reveals that, ultimately, none of this is much of a surprise to him. Lori Phillips, no stranger to SO audiences, covered the role of Brünnhilde as Alwyn Mellor was ill. But as soon as she opened her mouth for 'Heil dir, Sonne!' it was clear that there would be nothing wanting from her vocal performance. 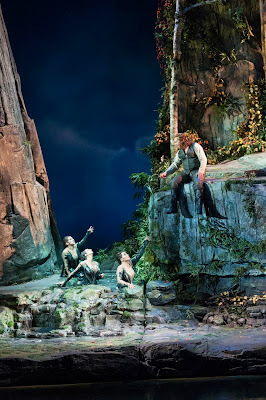 The closing moments as Siegfried convinces the reluctant once-goddess that she must indeed love him as he does her are compelling; is she afraid in a sort of Oedipus-by-proxy complex as his aunt, or is it awakening to the newfound realities of her mortality that frightens her so? Phillips doesn't answer that, but the dawning reality of her love for Siegfried makes the question moot. Many people know Michael Karman. He's the quiet, unassuming fellow who helps Michael Parsons (Mr. Opus 99) sell recordings at concert venues like the Schnitz and Kaul Auditorium. What people might not know is that Karman is an expert on new music and is the mastermind by Asymmetry Music Magazine and that he often travels to Europe in order to cover new music concert. Because of his all-consuming passion to attend even more concerts in Europe, Karman plans to move to Spain in September where he will set up his base of operations. In preparation for this move, Karman is offering a lot of his CDs for sale - at $2 for each CD. That means, for example, that an opera that has 3 discs goes for a mere $6. 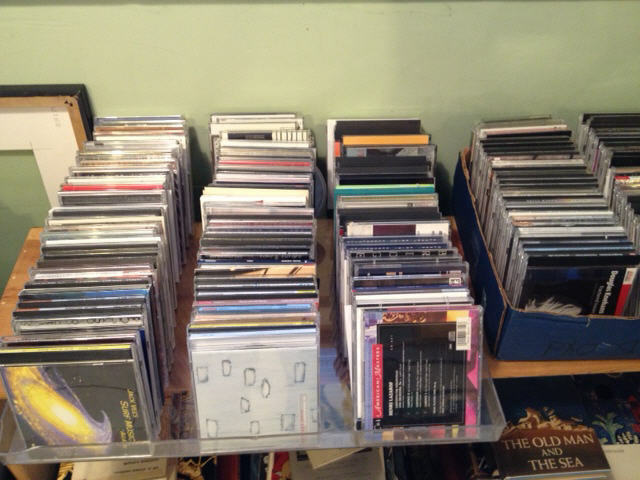 I purchased a short stack of recordings and there are plenty more left. The photo above shows only a sample of what Karman has. If you are interested, you can contact him via email at michaelkarman@gmail.com or give him a ring at 347-863-2954. Maybe you can put a dent in his collection. Even if he can sell everything that he would like to sell, Karman still intends to take 2,000 CDs with him to Spain. Ole! Wagner’s Die Walküre, Greer Grimsley (Wotan). The murmuring ebb and flow, the ceaseless foreboding suppuration of the orchestra held the audience riveted and hinted at the sea, but it was not the earthly sea--it was the sea of events set in motion by Wotan's terrible will as the curtain raised for Seattle Opera's Die Walküre, the second chapter of Wagner's great tetralogy being performed on Monday August 5 at the McCaw Hall in Seattle. A word must be said about Thomas Lynch's fantastic set design. The primeval forest in which Sieglinde and Hunding's hut is set immediately impels the viewer into the universe unfolding before them...the titanic tree branching through the dwelling like Yggdrasil, the ancient, darkling woods into which the stage recesses...without exception Lynch's sets have been key to creating the suspension of disbelief necessary to become engrossed in this apocalyptic story. Wagner’s Die Walküre, Alwyn Mellor (Brünnhilde), Greer Grimsley (Wotan). Stuart Skelton's feisty, fiercely intent Siegmund was well met by Margaret Jane Wray's trembling though brave Sieglinde. There is never any doubt for a second, from the moment she lays eyes on his sleeping form at the hearth, that theirs is an unbreakably magnetic attraction--indeed it is something far beyond their control. Skelton's and Wray's interactions are completely convincing. And vocally they are spectacular...as Siegmund cries out his father's name "Wälse! ", his note was held for so long, with such heldentenor power, purity and surety that my breath caught and everything else was forgotten but this incredible moment of sound and myth. Of special note was Wray's lower register--incredible and magisterial, imminently audible no matter the volume of the orchestra. Andrea Silvestrelli's basso, something I remarked upon as he sang Fasolt in Rheingold, was if anything in even finer form as the bestial Hunding; so rolling, thunderous and penetrating at these Stygian depths that it was frankly astonishing. Peter Kaczorowski's lighting was key to making the spring love scene between Sieglinde and Siegmund so believable--as the blessed sun thunders into the hut and their love begins to bloom, it is a striking and deeply symbolic contrast between the dim, gloomy depths of despair in which Sieglinde exists with Hunding, and as the light slowly dawns so does their love, and their realization of their kinship. Wagner’s Die Walküre, Stuart Skelton (Siegmund), Greer Grimsley (Wotan). Grimsley's Wotan reveals himself to be many things in Die Walküre, and at first is an earthly approachability, convincing us that he is merely a husband being subject to a wife's wroth. But Fricka is unlike an earthly wife. Stephanie Blythe's peregrination from rage to sorrow, pleading to iron and undefiable sternness is the only thing that allows one to make sense of Wotan's decision to send his own spider web of plans into wrack and ruin...it is less for love of Fricka than in deference to her implacable certitude. Grimsley makes us truly sad for Wotan---such lyricism and softness as he tries to convince himself and Fricka of the necessity of following through with the path that has been set, though it seems he knows even to himself that his pleas will be fruitless. When he finally invokes his own curse, praying for his own death, we understand why. Wagner’s Die Walküre, Luretta Bybee (Schwertleite), Sarah Heltzel (Siegrune), Jessica Klein (Helmwige), Margaret Jane Wray (Sieglinde), Alwyn Mellor (Brünnhilde). Wray's portrayal of Sieglinde's anguish is so believable as to almost be uncomfortable to behold as she tries to persuade Siegmund to leave her. 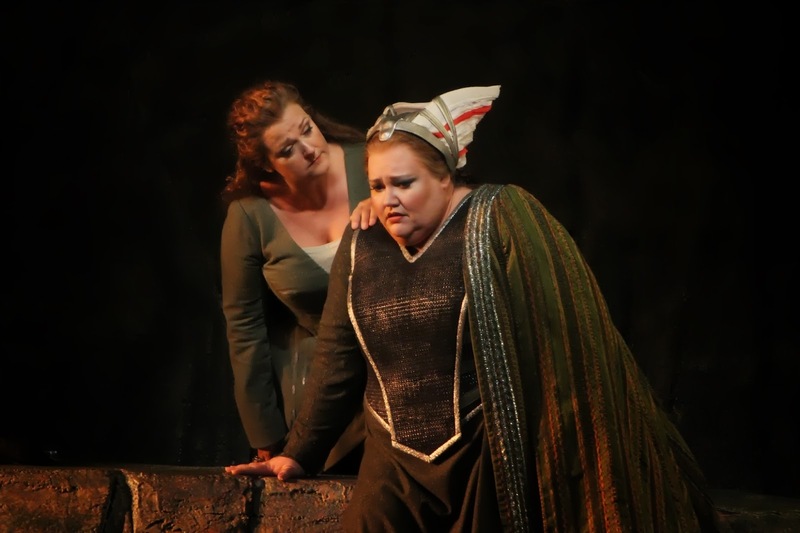 Alwyn Mellor, in her SO debut as Brünnhilde, is compelling as an actress, and as she wrestles with deciding whether or not to defy Wotan her volume becomes so low at points that there was positively no sound in the hall...everything hung upon her every note. The final duel between Siegmund and Hunding was a bit underwhelming when it arrived--not terribly convincing, and the "lightning flashes" throughout seemed unfortunately more like strobes than lightning, minor asides that distracted somewhat from the overall verisimilitude. The epic ride of the Valkyries too, while musically spectacular, left something to be desired from a set standpoint. Given all the grace and aerobatics granted the Rhine Daughters in Das Rheingold, it seems like something more could be had from this set in the way of blocking. Still the monolith upon which these lusty sisters congregated was magnificent and imposing, and the laugh-out-loud merriment and mirth with which they transported the corpses (and parts of corpses) of the fallen warriors to Valhalla was great fun to watch. The final sorrow between the defiant Brünnhilde and her anguished father showcased the spectacular upper registers of Grimsley's baritone, and revealed a sometimes too-quiet lower range from Mellor--her voice was entirely swallowed by the orchestra at key moments. As she further exposes Wotan's fallacious reasoning, in a sense continuing the castigation that Fricka began in the first scene, Grimsley shows Wotan's dimming furor and growing anguish and Mellor's performance forces us to beg the question: is Wotan really caught in a web of his own design, or does he ultimately choose to be there? The fiery mountain was beautiful and ominous to watch as this chapter came to a close. As a critic and audience member, I've been to many dozens of operas over the years; I've even performed in an opera (I was a singing waiter in 12 performances of Offenbach's La Vie Parisienne by a small opera company in the early 90s.) So while I'm no stranger to opera, at some point in an opera lover's life, one Ring cycle has got to be his first. For me the week of August 4-9th, in attendance at McCaw Hall for Seattle Opera's Der Ring des Nibelungen, is that first. In fact, it's my first Wagner opera. Period. That hasn't been by accident: Wagner can be intimidating, and many of the well-known and more abysmal components to his weltanschauung are terribly off-putting. But the last thing any critic wants to sound like is a newbie. After all, in the popular mind we're supposed to be people who have heard it all a million times before; world-weary, cynical and crabby. But at a lecture I attended in preparation for this event the speaker noted that, aside from Shakespeare and Jesus, more words have been written about Wagner than any about other man. It was hard to tell whether the remark was tongue-in-cheek or not, but in any case the point was well taken. So, with so many erudite Wagnerians pontificating and criticizing over the years, there surely must be room for one wide-eyed new guy to say honestly: here I am, I love opera desperately, and this...well, this is quite unlike anything I've ever seen before. Alberich seems to be simultaneously the most sympathetic and most loathesome character in this first work, and Richard Paul Fink's depth of experience with this role was immediately obvious. His Alberich was engaging and pathetic; by the time he renounces love and takes the gold to the shock of the cruel Rhinemaidens, there is no doubt as to why he is doing this or what his motives might be. Throughout the night whenever Alberich was onstage it was a constant battle to pity or hate him; his rolling, husky and sometimes growling baritone only lent added gravitas to the task of acting this complex character, and Fink was at once spellbinding and horrifying. As Alberich makes up his mind to seize the gold, once again the orchestra imbues the scene with the trembling sense that something terrible is building. When the gods are encountered, Greer Grimsley's Wotan and Stephanie Blythe as Fricka have an immediately intimate and yet troubled connection. Grimsley is appropriately statuesque in his king-of-the-gods bearing, and Blythe has an innate pathos in her anguish over her philandering husband. What a magnificent voice she brings, with every bit of the heft and lyricism one could imagine wanting from a Wagnerian soprano. The rapport between the gods as Fafner and Fasolt try to claim Freia was convincing and sincere: here is important stuff. Andrea Silvestrelli was incredible as the love-besotted Fasolt: immense and terrifying to behold in voice, stature and visage. His basso profonodo was magnificent. When the scene shifts to the dark and mysterious Nibelheim it feels like a shocking change from the "Green Ring," as this productions is nick-named due to the many green-hued sets. It felt like a guilty pleasure laughing at poor Mime (Dennis Petersen), being lashed by an invisible Alberich now drunk with power after his forging of the ring. 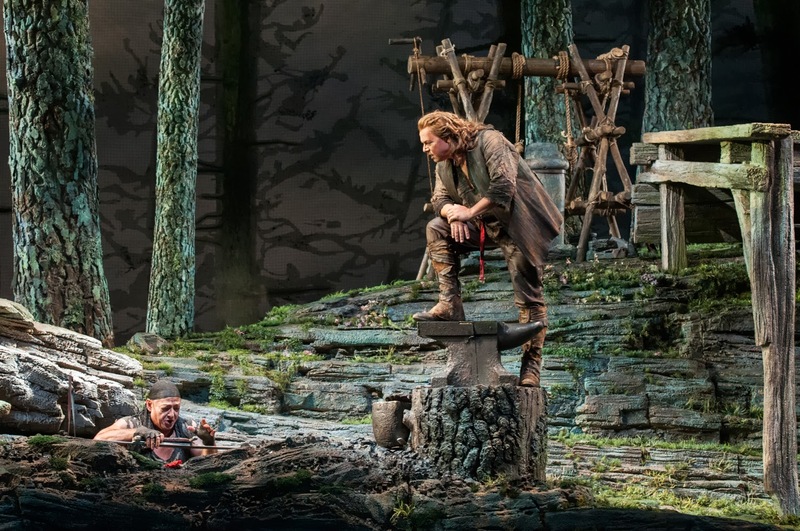 When Wotan and Loge (Mark Schowalter) descend to trick the dwarf out of his magical trinkets, the scene is set for high if dark comedy, and Fink, Grimsley (as our straight man) and Schowalter do not disappoint. Schowalter's Loge is in some ways the most interesting character; although he is a trickster, untrustworthy and conniving, he is yet employed by the gods to do their dirty work. Schowalter's interpretation yields a mirror with which to view the gods: as he is seemingly entranced by the dead Fasolt after the ring begins to work its deadly curse, it is clear whose folly has begun this terrible sequence of events. It's not the actions of Loge, nor even Alberich that will eventually bring the gods' downfall, and Loge is weary unto death of the breathless hubris of these immortals. Schowalter's understanding of this, and his ability to bring it out with such conciseness in his magnificent tenor, was truly one of the joys of this opening night. I will go a long way out of my way, and even ford a muddy stream or two, to hear good Beethoven played. Fortunately, on July 9, I didn't have to. CMNW's Beethoven week, featuring a Beethoven violin sonata, Beethoven string quartets, and the Archduke trio, was underway, and the Trimet Bus 20 took me from downtown Portland the Catlin Gabel school in a matter of 30 minutes. I tripped up the pleasant garden path with my fellow concertgoers, and in moments was sitting mere feet from the stage in a cool auditorium next to Carl, a classical music aficionado and CMNW regular who pops up like a familiar piece of shrubbery at every concert I've attended this year. We are now like old pals. The evening's programming was sure to please any Beethoven lover. The choice of the string quartet, op 92, "Serioso", followed by the violin sonata in G, op. 96, and finishing with the Archduke trio, allowed the listener to hear pieces of three differing characters of a composer who is often not appreciated in his true complexity. One heard the terse, urgently dramatic Beethoven in the "Serioso" quartet, the elegantly classical, somewhat interior Beethoven in the violin sonata in G, and the good humored, accessible Beethoven in the Archduke trio. The key word for this concert, despite the blazing technique displayed and the sometimes volcanic heat emitting from Beethoven's scores, was 'subtle'. This is because while the programming featured barnstormers such as the Archduke trio, and the strongly dramatic string quartet in F, op 92, the highlight of the program was, for me, the subtle understanding of and rendering Beethoven as a firstly a classical composer, rooted in the classical style. This was heard in all the pieces in the program, but most of all in the playing of the violin sonata in G major, op. 96, played by Alessio Bax, pianist, and Martin Beaver, violinist of the Tokyo Quartet. I consider their performance of this piece important for two reasons: first, it gave the listener an idea of the lesser-heard side of Beethoven, the more subtle and interior musical dialogues he was capable of. Secondly, it was an ideal vehicle to highlight the elegant musical artistry of Bax and Beaver as a duo. Although I missed the pre-concert talk for this program, I encountered the approachable Beaver in the hallway at intermission explaining to another concertgoer that Beethoven wrote this sonata in particular for a violinist who was no longer in his prime, so Beethoven had to restrain himself in the technical range in this sonata. The result is a piece that gives insight into the lyrical beauty Beethoven could create during his quieter moments: we hear Beethoven's love of impressionistic arpeggio sequences, double trills, cascading triplets,and some of the deeply moving slow themes he was capable of, particularly in the piano's opening to the second movement. For me, although obviously not a masterpiece of the same level, this sonata is somewhat reminiscent of the type of writing Beethoven employed in the Fourth Piano Concerto in G, Beethoven's most reflective and 'interior' piano concerto. This sonata opens with trill figures repeated by each instrument before launching into a gently acrobatic conversation. The piano and violin part closely mirror each other, and in sections where the instruments utter unison phrases, the agreement of articulation and timing displayed by Bax and Beaver was almost uncanny. (Beaver later revealed that the two had had time to rehearse in NY before coming the the festival, but that it was the first time the two had performed together.) Close to the stage, I could see Bax's hands, which were visible markers of the preparation he makes for each note; an intuitively discriminating pianist, he is capable of minute changes in timing and force which make him a fine chamber musician. 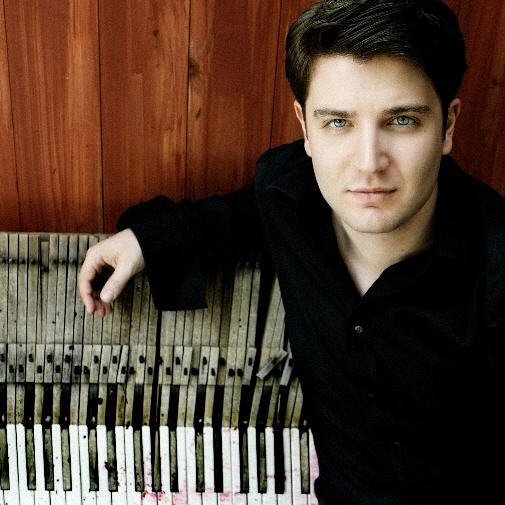 The introduction to the adagio espressivo, which is the piano's alone in this piece, was exquisitely played: Bax propelled it forward- then, by a change of direction in the phrasing, not speed, he expressed the finely tinged regret it contained. The last movement is a wilderness of development in which Beethoven eschewed all obvious pathways- Bax and Beaver brought the audience through the thicket to the typically Beethovenian ending. Bax and Beaver seemed to me to be temperamentally very suited as a chamber music duo, so I hope to see them in this capacity again. The concert started with the Miro quartet playing the op. 92 quartet in F minor, the "Serioso". The quartet strode onto the stage as if just exiting from the white heat of Beethoven's brain, and proceeded to dispense from within this chamber of intensity posthaste. Partly because they were all in white suits, and partly because they were subtly attentive to each other, leaning in and turning towards each other, they struck me during the performance as a quartet of 19th century ship's officers and a bartender having an impromptu but serious late-night discussion about tactics and survival prospects as a storm brews in the distance. Joshua Gindele, the cellist, is a communicative, soulful player, the understanding, actively listening bartender of the group. I have never seen a chamber music make more eye contact with his fellow players. Daniel Ching is the stoic captain. All the players were keenly attuned to one another. The terse compression and force of Beethoven's string quartet writing in this piece was fully appreciated by the players. Perhaps because of the intense motivic compression and development, I wished for a little more lyrical expansion during those few calmer moments of the piece, especially for any in the audience not already very familiar with Beethoven's quartets, but this was a small quibble in such a remarkable performance that was almost breathtaking. The Archduke Trio, op 97, finished out the concert, with Bax back onstage with Philip Setzer, violinist, and Fred Sherry, cellist. There was a slight roughness to this rendition of the trio that I found pleasant. The trio continued to display what I love about fine Beethoven playing-- to understand the departure from classical convention, you have to appreciate the convention. There is classical convention in this piece, and there is departure. Cellist Fred Sherry seems to love Beethoven- every now and then as he hit sforzando or a subito piano he would briefly let loose a wolfish grin. Since it is as fun for me to see people enjoy playing Beethoven as to hear it, I left a very happy concertgoer. Mozart’s “Eine Kleine Nachtmusik” (“A Little Night Music”) proved to be an excellent springboard from which the musicians and listeners could dive into newer works at the concert presented by Chamber Music Northwest on Tuesday evening (July 23rd) at Catlin Gablel School. It was solidly played by violinists Theodore Arm and Daniel Phillips, violist Todd Phillips, cellist Sophie Shao, and double bassist Curtis Daily, but it was the music of Benjamin Britten, György Ligeti, Paul Hindemith, and Joan Tower made much more of a splash at this performance. 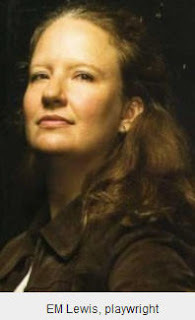 Hindemith’s “Kleine Kammermusic” (“Little Chamber Music”) was played engagingly by flutist Tara Helen O’Connor, oboist Allan Vogel, clarinetist David Shifrin, bassoonist Carin Miller Packwood, and hornist William Purvis. They seamlessly varied the tempo, found an incredible balance in the tutti passages, and allowed the colleague who had the theme of the moment to shine. Smooth phrases from the Vogel and Packwood against the rhythmically pulsating line of the O’Connor, Shifrin, and Purvis in the third movement and sudden sonic blurts from each instrumentalist in the fourth injected a bit of humor into this clever piece, which Hindemith wrote in 1922 when he was 27 years old. Taking things up a notch, Ligeti’s “Six Bagatelles for Wind Quintet” also received superb treatment from O’Connor, Vogel, Shifrin, Packwood, and Purvis. This ten-minute gem, written in 1953 when Ligeti was still in Budapest, travelled all over the place. The ensemble could create a jumpiness (first movement), paint a plaintive atmosphere that was punctuated by clashing sounds like Packwood’s insistent bassoon (second movement), hypnotize with lines that trickled down (bassoon and clarinet) against a melodic passages from the flute, blitz everything with a brief dance (fourth movement), create an homage to Bela Bartok with solemnness (fifth movement), and playfull sprint to the end (sixth movement). The most recently composed work on the program was Tower’s “A Little Gift,” which she wrote in 2006. This piece started with a unison note from O’Connor and Shifrin that was perfectly matched. If you closed your eyes, you would think that you heard only one instrument instead of two. The sound from the musicians diverged and seemed to climb higher and higher until climaxing a falling back to the unison note at the beginning of the piece, again matched perfectly in tone. The most stunning piece on the program was Britten’s Serenade for Tenor, Horn and Strings, in which Britten set six poems with startling fresh ideas back in 1943. An lush ensemble of 15 strings accompanied the remarkable voice of Nicholas Phan and the playing of William Purvis on the French horn, and together they evoked the haunting and sometimes brooding imagery of the poems, which included works by Charles Cotton, Alfred, Lord Tennyson, William Blake, Ben Johnson, and John Keats. Phan terrifically modulated from a vibrato to a nearly straight tone or vice versa to emphasize or downplay the text. He could turn up the volume or turn it down so that his voice always stayed just enough louder than the ensemble and his diction was impeccable so that phrases such as “dying, dying, dying” from Tennyson’s poem and “Christe receive thy saule” from the “Dirge” written by an anonymous author stuck in your head long after the music had vanished. Purvis gave an outstanding interpretation of the treacherous horn part, accenting the text and mood at times with a stinging tone. The strings also played with intensity and a wonderful sense of camaraderie because they didn’t rely on a conductor to lead them. At the beginning of the concert, artistic director David Shifrin told the audience that this would be the last concert at Catlin Gabel for Chamber Music Northwest. Next year, many of the concerts that would have been held at Catlin Gabel will be shifted to Lincoln Hall at Portland State University. Let's hope that Phan will be there in the near future.